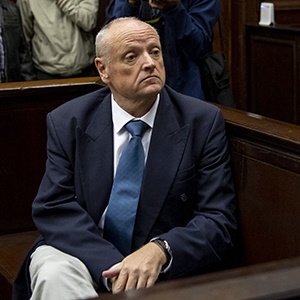 The State on Tuesday questioned Rob Packham's commitment to finding his missing wife and, after her body was found, keeping up to date with police's efforts to find the perpetrators. During his second day on the stand, prosecutor Susan Galloway continued her cross-examination of his testimony on where he went and what he did around the time of Gill Packham's disappearance and murder on February 22, 2018. One of the things she wondered about was why Packham did not personally enlist the help of friends and family by posting something on social media to find his missing wife. Packham said that he and his daughter Nicola had chatted around 17:30 or 18:00 that day about her suggestion to post something on Facebook. He said he also discussed this with his sister Judith when they had dinner and recalled a post already being up on Facebook by then. "At that point in time you had been searching for your wife the whole day. You alone. You were the only one who was searching for your wife actively, out there. You weren't getting anywhere," said Galloway. Packham shook his head to confirm he had not made much progress despite driving around. "You didn’t find any trace of her, neither did you find any trace of her car," she continued. He agreed. Galloway asked why Packham hadn't personally posted a timeous alert on social media. He admitted that he had not thought of using Facebook during the course of the day. He also said he did not think he had a large enough network on Facebook. She also wondered why he never took the advice of a police officer at Wynberg police station to head from there to the Diep River station to sign forms and get a reference number for a missing person case. "I had intended to do it on my way to my sister's but for some reason I forgot," he said. "I felt the information had been shared with them and I did not have a photo of Gill with me... He said the information would be sent through." Galloway said he had testified about telling the investigating officer, Sergeant Ivan Sonnenberg, that he was too tired to speak that night and had made an appointment for the next day, which he missed. Packham said he had been unable to sleep and drove along the coast, feeling even more concerned and in shock than he had the night before. "I went past all the beautiful view spots Gill and I used to go, wondering how this could possibly have happened to us," he said, adding that he unwittingly missed his appointment with Sonnenberg. In a traumatised state, he said he could not recall phoning or visiting Sonnenberg the first few days after his wife's body was found. Galloway asked why he didn't "camp out on the doorstep" of the police to get answers. He replied that they were waiting for DNA results and he didn't want to hound the police. She asked if he enquired about the investigation or whether anyone had been caught, after the body was identified. Packham replied that he asked for news when Sonnenberg was at his home. He said he didn't go to the police because he and his daughters were seeing Sonnenberg every day or two. Packham's trial continues on Wednesday.